Speak to Big Bonny — er, Herman — by her house in Silverglade, to see how you can help her fix the clock. When I fled Silverglade Village, I was so angry with myself that I threw all of my tools into the fountain. I forgot that I’d done that. I need them though, otherwise I can’t do anything about that broken clock! I don’t dare to move an inch outside my door, imagine what would happen if someone recognized me?! You though, my petal, have freedom to roam about unchallenged; nobody suspects you of anything… Ride over to the fountain and collect my precious tools. Ride! Hurry! Objectives: Find the Clockmaker’s tools in the Silverglade Village fountain. Ride down to the fountain the the middle of the town square and fish out the tools. Return to Bonny when you have all of them. Ooohh, Rita! My tools! My precious tools! Thank you so mu… But… They’re totally ruined! Oh my goldfish, why?! Why does this kind of baloney always happen to me?! MEEEE?! Even if my tools were repaired, it still would count for nothing. We need oil to lubricate the mechanisms. Actually, quite a lot of oil since it’s stood still for all these years. Who would even have any oil around these parts anyway? Nobody. No chance. Nobody, say I! What? Steve? Oh yeah, he’s probably got oil. But even so, dear Rita! It’s still a road to nowhere! It’ll never work! It’s a pathway to defeat! A highway to fiasco! Objectives: Ask Steve for oil. Ride out to Steve’s farm and ask him if he has any oil you can spare. Oil? Why, yes I do indeed have some black gold right here! Y’know there’s oil in that there tank, right Rita? Hmm? You think it’s diesel? Meh, it’s not that big a difference. One thing you should know about my diesel is that it’s particularly oily diesel, so it’ll work just as well. Trust me! Believe in Steve! All you need to do is take your bottle and fill it on up. I’m sure you can do that yourself. Objectives: Fill up the oil from the tank at Steve’s farm. Ride over to the large green tank on the outside of the stable building, behind where the for sale Friesians are located. Use the oil can from your inventory, then speak to Steve when you have filled it up. And so you have a full bottle of diesel oil, Rita. Hope it’ll be of use! Take care, see ya! Objectives: Ride back to Big Bonny with the oil. Check that crisis off our list! Hmm? You’ve filled the bottle with oil? Ooh! Excellent! Maybe there’s a chance the winds of luck could change after all! Ugh, what a disaster… Just as I thought I was going to be able to return to my regular old life, the wicked fingers of chance crush my dreams like crumbly little cookies. How can life be so hideous and unkind?! My tools are destroyed! If they can be repaired? Never. Impossible. How would that even work?! It’s over now, Rita. It’s all over. Just let me slither back into that sack and you can take me back to the silo. Hmm? You want to give a go at repairing the tools? That’ll only work when pigs fly, my treasure. Useless idea. What’s that? You have friends who can help you? The blacksmith? Meh, he’s very good, but not even his wonderful, skilled hands could work the kind of magic we need here. Objectives: Go to the blacksmith with the Clockmaker’s tools. Ride to Conrad in Moorland and ask him if he can fix the tools. Greetings to you, Rita. Might I help you with something? It’s not a simple project you’re asking me to work on. In fact, it’s probably the toughest thing you could ask a blacksmith to do, even a blacksmith as experienced as I. In order for me to even begin work on this mighty undertaking, I’ll need your help. You need to find a special type of iron from the heart of Garnok, deep, deep, down in the volcano which sprayed death and destruction all over Jorvik. 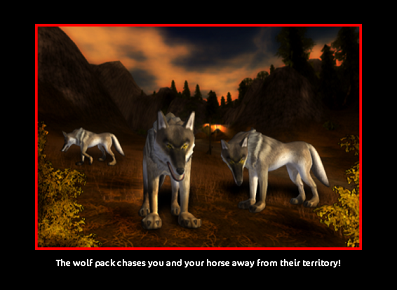 It’s a perilous journey, full of danger… You’ll be away from the safe embrace of Jorvik for quite some time. Worry not, little Rita, I’ll help you. In that box over there by the house, there’s a tent you can borrow for the journey. Fetch it and I can tell you more. Objectives: Fetch the tent and talk to the blacksmith again. A tent: the most important of travel provisions. Your journey to the heart of Garnok is going to take at least a month, and during that time, you’re not going to be able to see any of your friends or your horses. Horses are forbidden where you’re going, so you’re going to have to leave Summerblaze behind as well. A whole month without your friends or horses. It’s a serious sacrifice but I’m happy I can rely on you to see it through. So, Rita… Are you ready to start your journey? I was just joking, Rita! Pulling your leg! Rattling your cage! What a completely world-class joke! I don’t just forge the best tools, I forge the best jokes as well! Pffahahahahahaha!! Those tools were so easy to repair that I managed to fix the whole lot while you were rummaging around in that box over there. Heeeeeeeeheeheehee!! What a totally outrageous joke I just released upon you. This joke is going to be talked about by my children… And my children’s children… And my children’s children’s children! In a hundred years, they’ll still be talking about the funniest joke in the history of all Jorvik! Here are the tools, Rita. Give them to your friend the Clockmaker. Objectives: Ride back to Big Bonny with the newly-repaired tools. Big Bonny will be happy to have her tools fixed. Sigh. It all came to nothing, didn’t it? Just as I predicted, a total disaster. Another disappointment. Another tragic chapter in my heartbreaking story. If I want to see the tools? Pff. Nah. What difference would it make? What…? Wait…! They look like new! Have I been released from the claws of fate? Have the winds of my destiny finally changed?! Now maybe there’s a chance for us after all Rita! Now the hour is upon us. We’re going to try to repair the clock! It’s a very serious defect and if I wasn’t such a master clockmaker, I would probably have been forced to give up. But don’t be afraid, young Rita! I shall give you all the knowledge you need to repair it! Why am I not doing it myself? Well, I’m sure you understand that it was a deeply troubling and emotional experience for me to come back to the scene of my own personal apocalypse, and I genuinely don’t believe I’ll ever be able to go there again. I was about to faint and fall down while I was up there! That could easily have been the end for me… Plummeting to an early grave. I can’t go back. I won’t go back. And I can’t go back. I’d like very much for you to help me with this, Rita. Not for my sake, but for the sake of the sweet, sweet villagers! Don’t leave them high and dry, forced to live every day in a meaningless, clockless life. You’ll help me? Miraculously marvelous! Now I’m going to tell you exactly what you need to do. The most important thing is that you carry out the steps in the right order. If you do it right, the clock will tick once more! If you do it wrong, then you just need to cross your fingers you’ve not flubbed and fumbled it too badly and come back to me so you can have another try. Step 1. Use the wrench on the wheel by the clock face. Step 2. Pour oil into the big funnel. Step 3. Use the clock winding key to wind up the spring. Step 4. Pull the lever to start the clock. Step 5. Cross your fingers! Step 6. There are no more steps. Dismount your horse to enter the clock tower. If you forget the order of the steps, be sure to check your quest log to view the quest dialogue again. If you are not sure which item to use, click on the sparkles to tell you what to use. The wheel for the wrench is at the middle of the tower, up two stairs from the entrance. The funnel is at the very top of the tower, up three stairs from the wheel. The spring is also at the middle of the tower, down two stairs from the funnel. The lever is on the same level as the funnel, up two stairs from the spring. When you and fixed the clock, return to Big Bonny. I’m a hero! A solid gold hero! I shan’t forget you, Rita. When I’m awarded a medal – a medal of amazingness – I’ll give you a special mention in my acceptance speech! Give the Council Man the Fantastic News! Now, not to be too much of a big brash smartypants, but I do rather believe that now I’ll get both the medal and probably some flowers from the Council Man. Maybe he’ll even organize a parade or festival in my honor! I’m pretty certain he’ll be doing that. I can see it now… “Carnival á la Big Bonny!” Ohhhh, today is a wonderful, marvelous, magnificent day, my little Rita. Come on, let’s go! Objectives: Meet Big Bonny at the Council Man’s place in Silverglade Village. I’m sure the Council Man will be just ecstatic. He’ll jump for joy! Oh, hello. Clockmaker Big Bonny… Not seen you for a while. Well, well, Big Bonny! Nice to see you again. Listen, while you’re here, do you think you could have a look at that broken clock? Nice one. Hmm? Oh, it’s fixed already. Neat. Yep, well, excellent. Thanks for that. Now, you’ll have to excuse me, I’ve got lots to be getting on with. Bye. Objectives: Tell Big Bonny what the Council Man said. Tell Big Bonny what the Council Man said of her return. Wh… What did he say? He hasn’t even noticed I’ve been away… Am I that insignificant? Mmmmeeeeeeehhh, am I not worth more than that?! So, nobody’s even noticed that I’ve been away for five years. I’m worthless. A little, meaningless insect. An ant. A louse. A tiny beetle. I’m a pointless little cockroach! Objectives. Talk to the Council Man again. Tell the Council Man that Big Bonny is upset. Hi Rita, can I help you with something? Why does Big Bonny look so sad? What’s happened? What? Cockroach? Oh, now I understand. So she’s lived in exile for years because she made a mistake that she thought would destroy the whole village? Now she’s repaired the broken clock and thought she’d be carried through the streets in celebration? How should we go about fixing this Rita? Everyone has wristwatches and cellphones these days, there’s nobody who really needs the Town Hall clock, it’s mostly just nice to look at. Hmm… Well we have to try and get Big Bonny in a better word, don’t we Rita? Let me have another word with her. Clockmaker Big Bonny? Please do excuse my earlier performance. You see, without the Town Hall clock to wake me every morning, I’ve slept so badly recently that I’ve basically turned into a zombie. I think that’s why my reaction earlier was so, umm… Casual. Now the news has had a chance to sink into my head. Not as sharp as I used to be, you see. What you have done is totally wonderful! Just think, when you left town we were so completely furious and thoroughly disappointed in you, and we just couldn’t understand how you could have left us with a broken clock. But after some time, we began to understand what a terribly difficult job you had, especially after each and everyone of us tried to get up there and fix the clock, each one of us failing horribly! Now you’re back, and in less than a day you’ve got everything fixed. You’re a true hero! As a thank you for your efforts, I hereby declare you Silverglade Clockmaker of the highest order! Clockmaker Big Bonny, thank you again! Please never leave the village again! We couldn’t survive without you! Objectives: Talk to Big Bonny. Big Bonny finally gets the recognition she expected! Oh, Rita I absolutely knew it! Not to be big-headed, but like he said: without me, the village would never survive. That’s decided: I’ll never leave the village again. Never ever! Thank you for all your help Rita! Here’s a lovely little thing for you as a token of my gratitude. Now, I have to get myself home again, because as I’m sure you understand, there’s quite a lot of cleaning to do after five years in exile! Come and visit me should you ever find the time. Goodbye! Tyra has finished building the doghouse for Techno. Hi! I’m ready with the doghouse now! I’m really happy with how it turned out, I think my old woodworking teacher would give me an A. Can you carry it with your horse and place it outside the riding arena? I’m so excited to see if Techno will like it! Objectives: Place Techno’s new doghouse and see if he likes it. Go down to the riding arena and place the doghouse near Techno, then return to Tyra. Did he like it? Oh, I’m so happy! Many thanks, Rita. The riding arena will be safe from now on. The Baroness said she wanted to talk to you, by the way. So nice seeing you again, Rita. I wanted to give you a small gift because you have been so kind and helpful t us at the Manor. Unfortunately I don’t have enough evidence to be able to catch Mr Kembell this time. But may God forgive this man if he tries to vandalize anything here again! The Baroness will give you her gift. Here is your gift Rita, it’s Techno’s favorite pattern. I hope you and Summerblaze will like it. Now I’m looking forward to some peace and quiet at the Manor. It’s about darn time somebody asked about the South Iron Gate. Let’s go see the Council Man in Silverglade Village about it. Why is the Gate Still Closed? I’ll tell you, it is very strange… The gate to Goldenhills Valley is always opened in the spring. Every year around this tie Klaus, the mayor of Cape West Fishing Village, opens the gate. This has never happened before… I bet you would like to know why it is closed in the wintertime? Objectives: Speak with the Council Man. The Council Man will tell you more about the gate. Well, the gate to Goldenhills Valley has always been closed in the winter because of the mystical snow ghosts and other dangerous winter spirits that rage through that area in the winter. By closing the gate we’ve managed to keep them from intruding in Silverglade. Those spirits are dangerous and can frighten both children and horses… So closing the gate every winter is very important. I’m not sure how we are going to manage it… Mayor Klaus locks and opens the gate with the Key to the City he always carries around his neck. You might have seen a painting of him in the castle at Silverglade? No? Ride to the castle and look at the painting. It is around to the right inside the door. Who knows… Maybe it will give you an idea for some solution to our problem. I’ll continue to try and find a solution here while you are away. 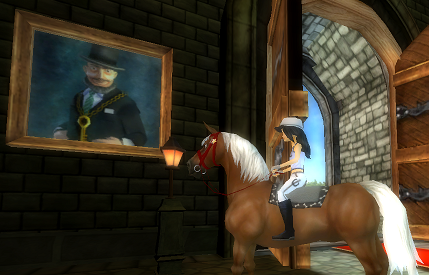 Objectives: Ride to Silverglade Castle and have a look at the painting of Mayor Klaus. Go inside the castle doors and turn to the right. The painting is on the wall next to the door. “…The Key to the City that opens the locked gate… Hmm… The painting is very detailed, someone could probably make a copy of the key if… If someone had a copy of the painting! Objectives: Explain your idea to the Council Man in Silverglade. Go back to the Council Man and tell him your idea. So, your idea is that we take a photograph of the key in the painting that someone can use to make a copy of the key… And we can use that copy of the key to open the gate? You think you can borrow a camera from James to take a photo of the key in the painting in the castle? Ok, ride to Fort Pinta and ask the little guy! Objectives: Ask James in Fort Pinta, if you can borrow his camera. Hmmm… You want to borrow my camera? Ok, Rita. You can borrow my camera, just because it is you! But as soon as you are done with the camera please take it to Derek who is working at the post office in Silverglade. Derek also wanted to borrow the camera. I think he might even print out your photo for you! I’ve heard he has the equipment he needs to print out photos at the post office. Objectives: Go take a photo of the painting in the castle. Leave the camera with Derek at Silverglade’s post office. Go back into the castle to take the picture. Then go to Derek in Silverglade Village. Aha! I finally get to borrow James’s camera! I’ll have you know I am an excellent photographer. Before I started work here at the post office I used to take pictures for a bunch of the big fashion magazines. Just so you know, it was me who took the first photos of Anne when she went to school in Jorvik. Aha… You want me to print out your photo? Objectives: Take the photo to the Council Man. That was fast. And what a great photo! I’ve been standing here thinking about who could possibly make a key with only a photo to go by… But I haven’t come up with anyone. We don’t have a locksmith here… Have you thought of anyone? Can You Forge a Key? Aha! I didn’t think of that! You are right. Conrad Marsdeen in Moorland is a well-known master blacksmith. It was great that you thought of him. Take the photo with you and ask him if he could possibly forge us a copy of the key. If all goes well I’ll wish you luck in Goldenhills Valley. Don’t forget to send my best wishes to Klaus when you ask him why he didn’t open the gate this year. Objectives: Ask Conrad if he can forge a copy of the key in the photo. Go to Moorland with your photo and ask for his help. Rita! I haven’t seen you for a while. You are wondering if I can make you a copy of a key? The key to a city? Okay… The ends justifies the means. I’ll help you so that we can find out what has happened in Goldenhills Valley. I need iron ore to make you a new key. You already know that iron ore is in the Demascus Mine just southwest of here. Take my pickax and ride over to the mine to get me some. When you get back we’ll get started. Objectives: Use the pickax in the Demascus Mine to chip out three chunks of Jorvik iron ore and come back to Conrad with them. Wonderful! You have done this before so you are getting good at it now. This might take a while, but if you help me, the first phase of the forging can go smoother. At least you’ll get to practice your smithing skills. Who knows, some day you might be a real blacksmith’s apprentice? Listen here… Sometimes we need to work the iron on the anvil with the hammer and sometimes we’ll need to heat the iron in the forge with the tongs… And sometimes we’ll need to cool the iron in the bucket with the water. I’ll tell you which thing we need to do and when. Timing is always important… If we get it wrong we’ll have to start over again. Remember you’ll need to get off your horse when we start forging. And put your horse a little distance off so we have room to work. Here are the tongs and hammer. Get ready to use them. Objectives: You need to get off your horse and help Conrad forge the key. Use the tongs and hammer to carry out his instructions. Be careful! Conrad will start counting down time. It’s best to keep your inventory window open for this next part. He will give you three different instructions: heat the iron, work the iron, cool the iron. Use the tongs on the forge and the water bucket, and use the hammer on the anvil. Use each tool before time runs out. If time does run out, you will have to start the work over again. When you’re done, speak with Conrad again. You were a great apprentice, I have to say. I’m sure you could be a great blacksmith someday if you try. Now I’m going to finish the work with the key and then the iron needs to rest until tomorrow to harden properly. Come back tomorrow and the key should be ready. The Council Man in Silverglade Village has news for you. In Your Face Old Man! Wait, one more thing… There is one more detail that I think needs your attention. It has taken quite a while, but I have finally gotten the official indictment against G.E.D. The bosses of Jorvik want me to deliver the indictment to Mr Kembell, but I have a lot to do here in the city and I know how much you like to do things that drive Kembell crazy. What could possibly make him more angry than you delivering the indictment to him personally? 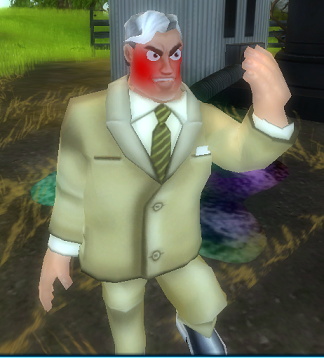 Mr Kembell is still glaring at his oil drills north of the Winery, you can find him there. Objectives: Deliver the indictment against G.E.D. to Mr Kembell who is standing near the oil drills near the Winery. Ooh this should be good! Wait while I get my popcorn. Grrr… It says that Jorvik City is charging me with fraud in the tenancy agreement where they think they can prove I have been using stolen oil drilling equipment. Catastrophe and madness! This is all your fault! You win for now… I will run while I can this time. I have found new places I can exploit for their natural resources on this stupid island. And this new place is a long way away from you AND your stupid horse! Wow, that really got him going. Mr Kembell should remember his blood pressure! Ha ha ha! We’ll have to hope that Jorvik City has what they need to make the charges stick. Mr Kembell is a dangerous man when he is angry and has the law on his side. But it is great to get rid of him for a while. Thank you Rita for your help.